Cardboard palm. 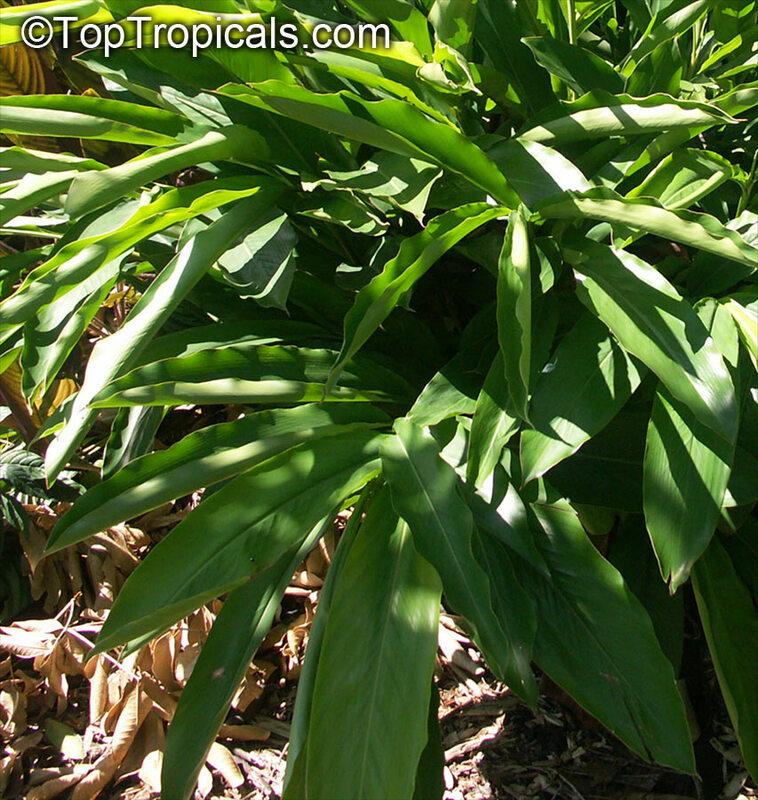 It is a great houseplant tough enough to survive occasional neglect and harsh indoor environments. With it beautiful shape, exotic looking cones and instinct for survival, cardboard palm is one of favorite house plants or garden specimens. Calla Lily. 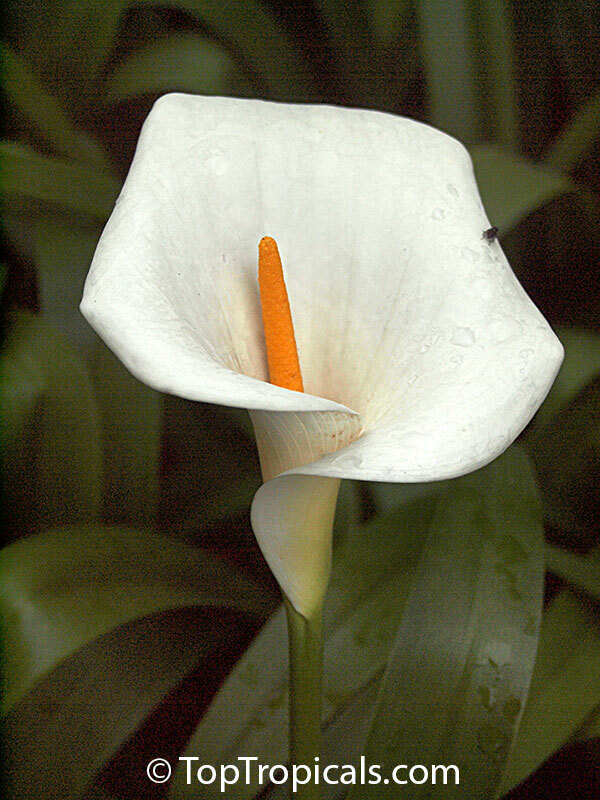 Zantedeschia aethiopica is a rhizomatous herbaceous perennial plant with beautiful waxy white flowers so popular as cut flowers. It is evergreen where rainfall and temperatures are adequate, deciduous where there is a dry season. Spice Ginger, Cooking Ginger - Plant this ginger in the garden to produce your own fresh ginger. 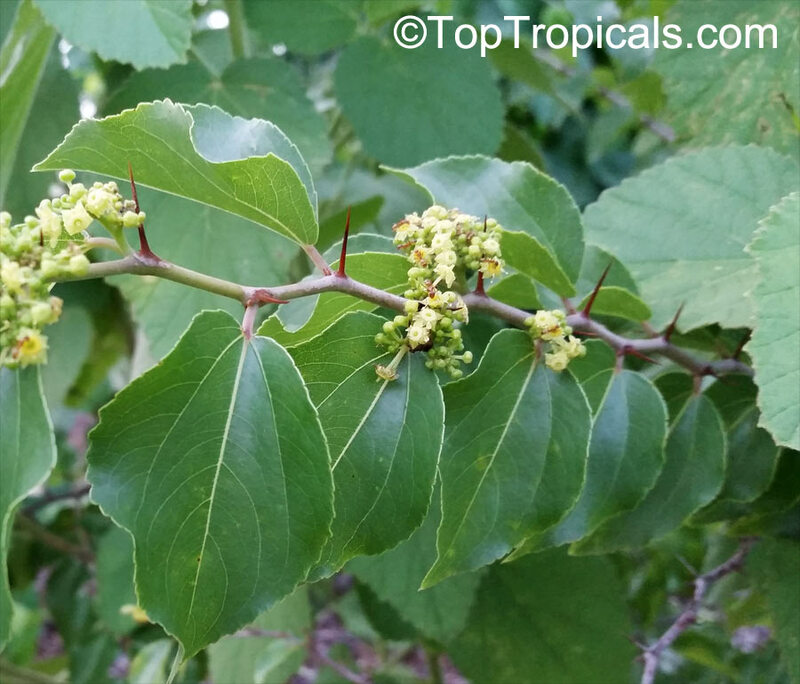 This plant is deciduous, leaves die back in winter and grow back in spring. Bengal Ginger. Origin: India. 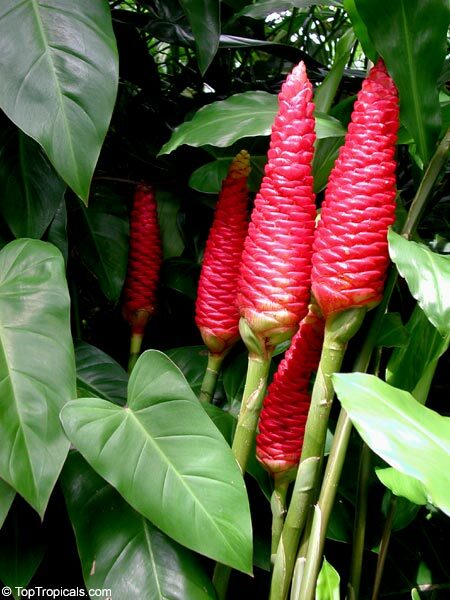 Bright red flowering cones bloom at ground level and even partially below the soil. Each scale produces a single inch-wide red flower with a creamy colored lip marked in red. Winter dormant. Rhizomes remain underground through winter. The seed capsules are used in India as a spice. Pine cone ginger, Shampoo Ginger. All parts of this ginger are spicy fragrant. 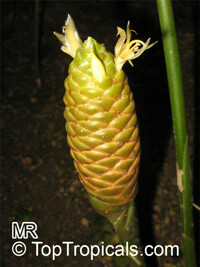 The cone shaped flowers are long lasting and useful for cut flower arrangements. This plant is most widely known around the world as the Shampoo Ginger for the milky substance in the cones, and it is in fact used as a shampoo in Asia and Hawaii, and as an ingredient in several commercial shampoos. 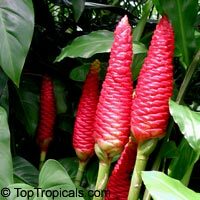 Pinecone ginger is considered a canoe plant, that is, a plant introduced throughout the Pacific by the ancient Polynesian settlers. 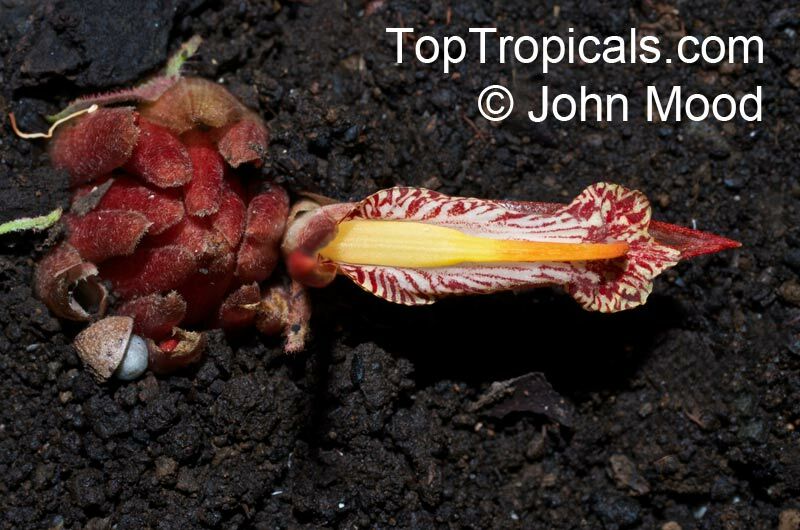 These small acid fruits are liked by children as well as by adults. A small spreading tree, with drooping branches grows readily and quickly on poor ground. Even moderately saline soils are tolerated. The tree will thrive without any special care. All parts of the plant have medicinal uses. 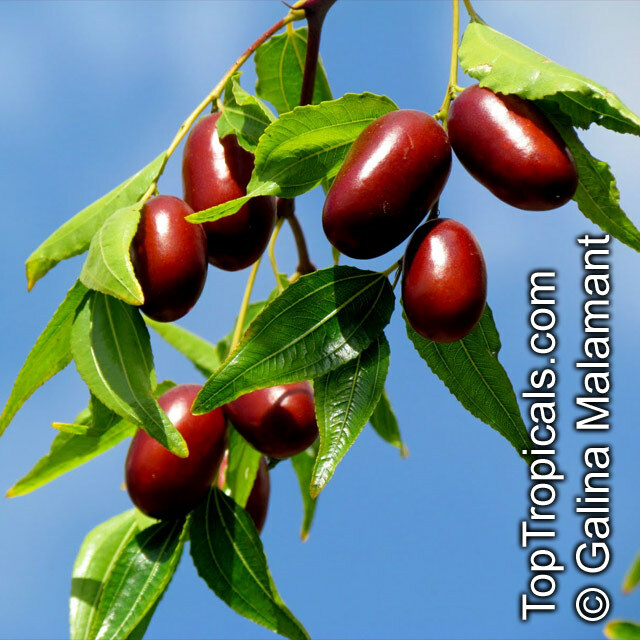 Jujube is widely cultivated China and India. 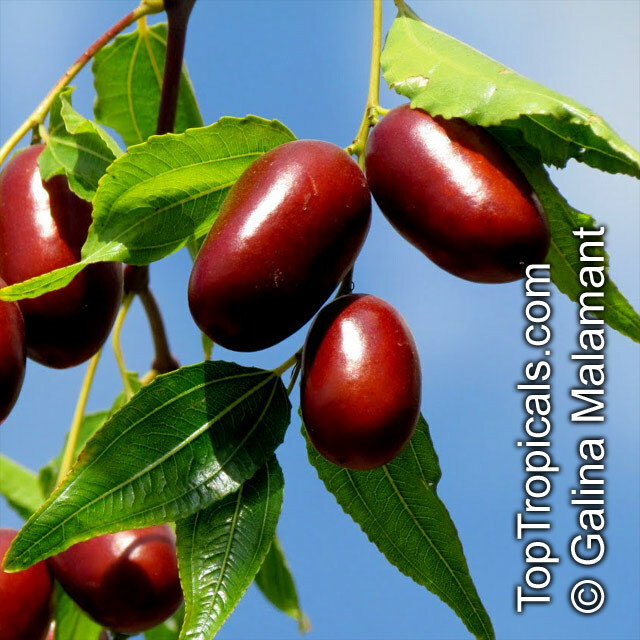 The Chinese have been growing and eating jujubes for more than four thousand years and have more jujube trees than any other type of fruit tree. 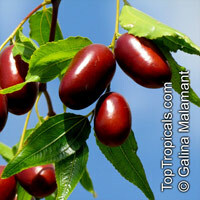 Indian Jujube, Chinese Date - The fruits have medicinal use and are considered to be cooling and tonic. These small acid fruits are liked by children as well as by adults. A small spreading tree, with drooping branches grows readily and quickly on poor ground. Even moderately saline soils are tolerated. The tree will thrive without any special care. All parts of the plant have medicinal uses. Soak seeds for 2 days, changing water daily. Plant 1" deep, keep warm and damp. Slow germinating. One of the most widespread of South Africa's tree species. 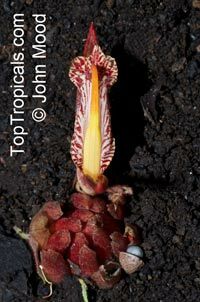 The glossy, drooping leaves are conspicuously three-veined from the base. The branches are usually covered with stipular spines, one curved and one straight. Inconspicuous yellowish flowers are borne in clusters and produce abundant nectar that attract many insects, especially bees. The roundish fruits are russet-colored when mature and contain a dry meal-like pulp. During the Anglo-Boer War, the seeds were ground and the powder used as a coffee substitute. 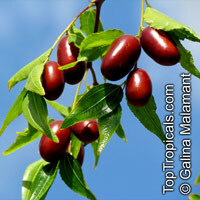 It is a very rewarding garden tree, growing well in any climate but a cold, wet one. 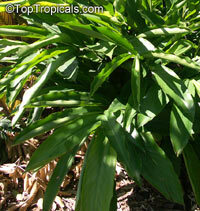 It is drought and frost resistant and is a good choice for gardens where little else can grow. Extremely rare collectible palm that is hard to find. A medium sized, clumping fan palm. 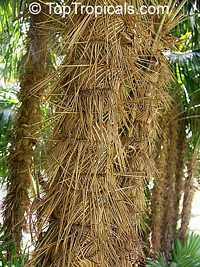 Has a woven like mat of fibres, with downward pointing spines on the trunk. very exotic and impressive look. 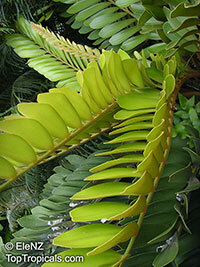 This palm can be a centerpiece of your plant collection! It is very slow growing. The plants we have in stock are nice developed size.